You know there's nothing quite like recovering from an illness that knocks you flat that makes you think about your mortality and about little things that others take for granted that you relearn or develop the strength to do for the first time. As I begin to regain my strength, this was really a week for that kind of reflection and that kind of development. Some really simple things occured this week. Simple for you, maybe, but for me somewhat momentous. First I had visitors! Yep, Megan and Mikayel came by. 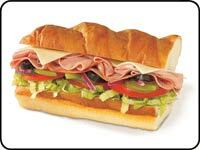 Second, they brought me lunch: a loaded down six inch submarine sandwhich with vegetables! (Another first!) Lettuce, tomato and pickle garnished this delicious turkey submarine sandwich. Third, today I had my first shower since mid-October. What a joy. Lest you think I haven't been washing, because of my lack of strength I couldn't stand very long so I've been taking baths. But it's just not the same. I know you'll laugh but you just never know how much you've missed something until you've done it again. And fourth, I've started reading books again, picking up the same one I left off half way through in mid-October. All in all it's really been some week. Oh yeah, and big birthday wishes go out to Jim and to Megan!! !